New England Patriots coach Bill Belichick said it's too soon to say if tight end Rob Gronkowski might be able to play again this year. Gronkowski is scheduled to undergo back surgery on Friday for an injury suffered in last week's game against the New York Jets. 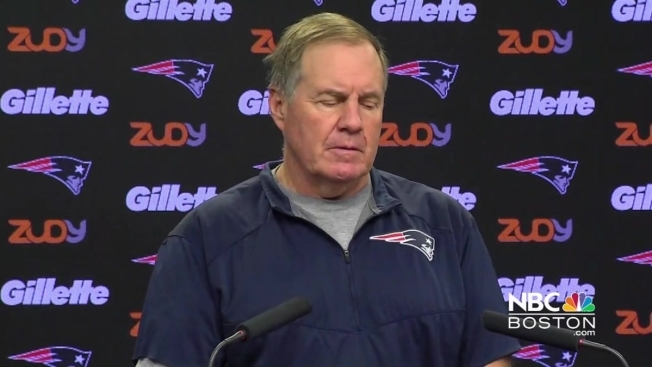 "Obviously, we're all disappointed," Belichick said at his Friday press conference. "Nobody's worked harder than Rob, or been a better teammate, so hopefully things will work out as positively as possible for him... It's an unfortunate situation." A joint statement released Thursday by the team and Gronkowski's family said he is not expected to be able to play for the remainder of the 2016 season. But the statement wasn't clear on whether that included the playoffs. The Patriots tight end is scheduled to undergo back surgery on Friday. Asked if the statement released Thursday means Gronkowski is out for the playoffs as well, Belichick was noncommittal. He said it's too soon to say whether Gronkowski will be placed on season-ending injured reserve. "There's obviously more information coming," he said of Friday's surgery. "Right now we have what we have. When more information comes, there may be another decision to be made. I don't know." Quarterback Tom Brady talked about the challenge his team faces with Gronkowski injured in an interview with Westwood One Sports on Thursday night. “To not have Gronk out there and one of our best players and most dependable consistent players not in the lineup makes things challenging for us, but that’s what the NFL season is about," he said. "It’s about overcoming challenges." Brady said everyone on the team will have to step up to make up for a season without their star player. "We’ve played games this season without him and we’re going to need to reach a higher level as individuals so we can reach a higher level as a team,” he said. This is the third time Gronkowski has had back surgery since 2009. He has also had four forearm surgeries, knee surgery and ankle surgery.